There are just over a hundred recorded Roman emperors but few of them had as much impact as Diocletian. It is a very human failing to imagine that we are immortal and to take little thought for the consequences for the world when we are no longer in it. Despite their important position, the emperors were no different. Few thought beyond the immediate question of who would succeed them. Some didn’t even do that. But to his credit, Diocletian attempted to ensure that the Roman world would never be without a leader. But as any manager will tell you, getting people to do what you want tomorrow is hard enough, even with autocratic powers. Trying to make arrangements stick long after you are dead is one heck of a challenge. He deserves full marks for trying. The crisis that had afflicted the government of the empire for so long had largely been due to nobody really knowing who was entitled to rule. This confusion had led to a huge amount of bloodshed and had nearly finished off the empire altogether. Diocletian’s innovation is known as the tetrarchy – the rule of 4. The idea was that you had two senior emperors, known by the title of Augustus, one in the East and one in the West. Both had equal authority, and edicts were issued jointly in both their names throughout the empire. This wasn’t splitting the empire, simply splitting its administration. Each Augustus appointed a Caesar, who again had half of that segment of the empire under him. 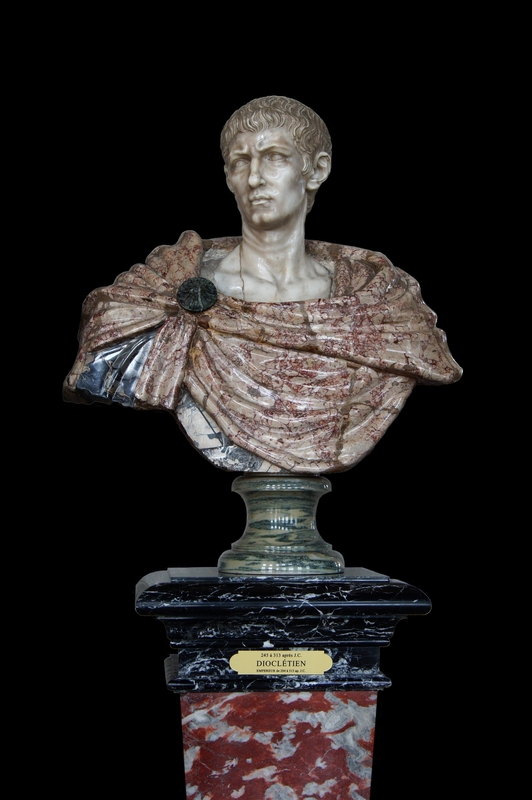 In the event of the death of an Augustus, the Caesar would take over and appoint a replacement Caesar. It was a neat system. No longer was everything totally dependent on the health and sanity of a single individual. There was a clear procedure in place to ensure that succession – always the weak spot in the imperial constitution – was predictable and timely. And there would always be the forces of the other half of the empire available to ensure that this went smoothly. A rebel bent on overthrowing the existing regime and installing himself would have four armies to defeat . It was no longer simply a matter of marching on Rome and intimidating the Senate. The Senate no longer had any role in high politics even in theory. It continued to meet though, right up until the last days of the empire. In his time, Augustus had found it necessary to subvert the outward form of the constitution by stealth. By the time of Diocletian, the Senate could safely be ignored. On top of the obvious advantages for internal peace, the system also allowed for effective defences. There were effectively four armies under direct control of emperors. This overcame the tendency for the emperor to pull all the resources onto the campaign he happened to be concentrating on. The disastrous consequences of this were clear when Valerian marched off to Persia with a huge army leaving the Goths to pillage Asia Minor at their leisure. Anyone who has ever managed anything will be well aware that no matter how good a system looks on paper it really depends for its success on the people who operate it. There are few examples of successful power sharing in Roman history – or any other history come to that. But Diocletian seems to have managed to pick a set of men who genuinely worked well as a team. His own personality was the key. It’s a shame we know so little of how this remarkable man succeeded in rising from very near the absolute bottom of Roman society to holding the top job. And not only that, but ending up as one of the most illustrious and influential of its holders. His parents were slaves. He had grown up in the household in Dalmatia where they had served. So he didnít have the backing of a respected family. In fact even his name was obscure in origin. It may be that he was originally called Docles after the town, Doclia, where he was born and later modified it to the more latin sounding Diocletian as his ambition grew. He started his career as a clerk, switched to the military and steadily rose through the ranks until he obtained the plum job of commander of the emperor’s bodyguard where we found him at the end of the last chapter. That is some career progression. But the character he displayed on reaching the top can give us some clues about what might have been the reasons he so easily commanded the respect of the people he came into contact with. He managed to emerge as the leader of the eastern legions without any serious rivals. He started his reign without a purge of potential opponents. Most of the appointments of the previous regime were left as they were. He must have felt secure to do this, and it got him off to a good start in the popularity stakes. Standards for emperors had become pretty low by this stage and simply not acting like a tyrant from day one was enough to earn him good reviews. He showed good judgement in respecting the judgements of previous emperors in the selection of personnel. He also picked his fellow rulers in the tetrarchy with care. His selection for co-Augustus was Maximian. He was a soldier with whom Diocletian had a long standing friendship. At first sight they were an odd couple. Diocletian was a thinker and a strategist. He preferred a policy solution to violence when there was an option. Gibbon notes that later Christian writers have sought to discredit Diocletian by insinuating cowardice. This can’t be fair. It is impossible to believe that someone who could pull off winning over the support of the legions can have been a coward. But he felt no need to play the hero, and why should he? Maximian on the other hand was a soldier through and through and was quite keen on the use of force when the occasion arose. He reminds be a bit of Animal, the demented drummer from the Muppets. He left the subtle stuff to Diocletian. Diocletian and Maximian worked well together. The friendship that they had established before they came to power continued even after it was subject to the potential jealousies of power. Their different characters meant that as a team they could use the fear inspired by Maximian balanced with the more thoughtful nature of Diocletian – a sort of political good cop bad cop act. The two men gave themselves official and none too modest nicknames. Maximian was to be known as Hercules – the greatest human hero in Classical mythology. It was fitting – Hercules was a strong man who slew monsters and tyrants by the strength of his arms. Diocletian took the name of Jove, the powerful chief of the Gods who sets the Moon and Sun in motion and calls up the wind and rain and whose voice can be heard in thunder. Alright! Not bad for the son of a slave from an obscure town in the Balkans. The choice of Caesars to make up the team of four was equally well thought out. Galerius Armentarius was of common birth like Diocletian and Maximian. His second name means herdsman, and it was a literal description of his origin. He was compared to Maximian in character – though he seems to have been less violent and impetuous. But then, most people are less violent and impetuous than Maximian. He was allotted the defence of the Danube, always likely to prove the most troublesome spot in the defences. Constantius Chlorus was from a noble family, so it doesnít look like Diocletian was troubled by inverse snobbery. Chlorus means pale, though it is unlikely he actually had a pale complexion. His first military duty had been serving under Aurelian in the war against Zenobia, so he had had plenty of exposure to the sun. But his pitch was to be the cloudy and windswept north as he was in charge of defending Britain and Gaul against the formidable German tribes. The senior members of the regime took more comfortable regions. Maximian was in charge of Italy and Africa and Diocletian managed Thrace, Syria and Egypt. The revenues of Diocletian’s portion may well have exceeded those of the other three put together, so it was pretty clear who was calling the shots. Diocletian tied his team together closely via marriage and adoption. He adopted Galerius as his son and married his daughter to him. Maximian adopted Constantius and again married one of his daughters to him. Both the Ceasars already had wives incidentally, who had to be divorced in the interests of the new constitution of the empire. Roman politics was not a part time occupation. But above all the set up worked well because of the respect that Diocletian inspired. He must have been a man of great charisma. Gibbon, as always, puts it memorably. This then was the team that will be running the show for the rest of this chapter. The empire was in good hands.